It is now over a month since the election of Pope Francis and it is clear that he has a strong agenda of reform in mind. From his symbolic refusal of the red cloak on his election by the conclave, to his washing of the feet of young offenders in detention, both male and female, believers and non-believers, he has set a path of change in the Church starting from the top, but with ramifications for the Church as a whole. Of course it is difficult to get into the mind of a person who might have been pope eight years earlier, when it appears he requested those who were voting for him to direct their votes to Cardinal Ratzinger. Would the intervening years have been filled with 'what ifs'? Would he have viewed the direction taken by Benedict XVI and wondered how he might have dealt with the issues that arose? While we are not likely to know the answers to this without some personal revelation from Francis himself, it is clear that he came to the preconclave debates with a strong sense of purpose. As the cardinals gathered prior to entering the conclave they were given the opportunity to present their case for the qualities needed in the new pope. Cardinal Jorje Bergoglio, Archbishop of Buenos Aires, gave a speech which was ecclesiastical dynamite. He spoke of the dangers of a Church becoming 'self-referential' and 'sick'. He warned of the dangers of a 'theological narcissism' overtaking the Church. He referred to the Gospel image of Jesus knocking on the door wanting to enter our lives. 'But think of the times when Jesus knocks from within to let himself out. The self-referential Church seeks Jesus Christ within and does not let him out. Statements such as these do not arise in a vacuum. They are not a disinterested statement of timeless theological truths. They arise from an analysis of the current situation of the Church and the direction it had taken in the last eight and possibly more years. For all the personal respect and deference Francis has shown to his predecessor, these words read like a repudiation of the direction in which the Church had moved under his reign. What is more, this is the very man elected by cardinals handpicked by John Paul II and Benedict XVI with an agenda of reining in what was perceived as the excessive openness of the post-Vatican II Church. This is a truly remarkable occurrence, to the point of defying ecclesiastical logic. Francis has continued the same themes in homilies and talks, as well as through symbolic actions. In a recent homily reported by the Vatican Insider, Francis spoke of the need for the Church to build bridges, not walls. Christians who are afraid to build bridges and prefer to build walls are Christians who are not sure of their faith ... When the Church loses this apostolic courage, she becomes a stalled church, a tidy church, a church that is nice to look at, but is without fertility, because she's lost the courage to go to the outskirts. I remember when as a child one would hear in Catholic families, in my family, 'No, we cannot go to their house, because they are not married in the Church.' It was as an exclusion. No, you could not go! Neither could we go to [the houses of] socialists or atheists. Now, thank God, people do not say such things, right? [Such an attitude] was a defence of the faith, but it was one of walls: the LORD made bridges. It was not uncommon during the reign of Benedict XVI for people to speak of a 'smaller but purer Church'. While there was some debate as to the provenance of this phrase, and whether Benedict saw this as desirable or merely an observation of the direction the Church was heading, it would seem that to Francis such an outcome would represent a failure of courage on the part of the Church. He knows mistakes might be made in keeping the Church more inclusive, but he is not afraid of this. He knows too that it is difficult to evangelise a world that one constantly demonises. He wants to build bridges to the world, bridges of dialogue and cooperation. Whether they knew it or not the conclave cardinals initiated a quiet revolution in electing this man. The most telling word in this article is the word ‘reign’. There is only one religious leader in the world whose time as leader is described, or would be thought of, as a reign. And therein lies a lot of the problem with Catholicism. Too many people want to see all the answers and direction placed in the hands of one bishop. Papal power is one of the reasons the bishops could not act to address many of the terrible things happening in their dioceses. Bergoglio is leading by example, or at least by as much example as is possible in such a position in Rome, but too many Catholics want to see all the problems solved by a Pope, in the same way Americans believe that the President will solve all known world and domestic matters just by being President. Americans set themselves up to be disappointed. Catholics likewise seem not to want to let go of being led by a monarch with extraordinary autocratic power over their lives, rather than go where the spirit wills. They will look for any sign of ‘revolution’ or ‘change’ from above, when it should be happening where they’re at, not just because Rome says it’s okay. Bergoglio is certainly working signs and wonders, but he should be, he’s a bishop. If he’s a real bishop they may even crucify him by the end of the week. It’s quite likely that Bergoglio knows that. "He wants to build bridges to the world, bridges of dialogue and cooperation." You've nailed it Neil and for any Catholic of any hue, this will be both the invitation and the challenge of Pope Francis. I love the way he is seemingly 'smiling' through his words and short pithy anecdotes, all at the same time, revealing a judgement that must be taken notice of. But I still feel that Pope Benedict was also the right man for the job at the time, coming as he did after Blessed John Paul II. It's a bit like in the seminary when we had a couple of notable storytellers presenting lectures followed by a lecture on Fundamental Theology presented by Dr O! It got the grey matter working in some of the farthest reaches of our brains. I do so hope that your words are not just your hope for what is to come but that they are a light shone into a future where we can belong again to a community of Christians. We long for a poorer and inclusive eclesia abandoning hypocracy and power,adopting real collegiality where listening is more important than proclaiming and a collegiality where our bishops,good pastors that they are on the whole are listened to and heard. Thank you Neil. Thank you Neil for another insightful article. I was never comfortable with the idea of a smaller but purer Church. Part of Jansenist iconography is the image Christ crucified, face turned to heaven, torso hung low, arms close together. With Pope Francis we get an image of Christ crucified looking down lovingly on those who abandoned him when the going got tough, arms outstretched. There is a new spirit in the Church and there are echoes of the evangelical excitement that immediately followed Vatican II. Put on your seat belts we are in for an exciting ride. Congratulations on an article that sheds light and hope for future development of the Church. When Benedict XVI retired to contemplate the Mountain of God, hopefully he is now realising that God is calling ALL his Children up the Mountain, and that there are many paths up the Mountain, and that God's call to each is to start from where they are, with whatever resources they have. Modern research and insights reveal that although the Church has developed perhaps the greatest Ideals in the history of mankind, it has also embraced and absorbed many misconceptions and misinterpretations as it evolved. The first communities thought the world was about to end. When the message of "The Way" spread to the Gentiles, the Gentiles inserted their own traditions and their own interpretations. When Christiamity conquered the Roman Empire, and was conquered by it in return,the Romans did likewise, diverting further from the fundamentals of Love God above all, and one's neighbour as one self. God's children are not meant to remain isolated in the local communities from which they begin, but all the communities need to cooperate, like the limbs and organs of the human body, for the advancement of all. Thank you Neil. Your article today sort of made me a little teary. Hope and renewal for the church trickling down from the top is a good start. If we the rank and file get supported in building bridges, opening our hearts and minds, going out to the marginalized, the poor, forming action groups to do the ministry, inviting into our churches and lives all people , then living Catholic will hopefully be more meaningful . Maybe some of us will continue our "membership". And maybe even, others will join up. My own children have not seen the days of the church as "open" and of service to others. Fortunately they see members of church involved in social justice , such as refugee support, but they dont hear too much practical stuff from the clerics . Our kids live in a secular world with an irrelevant and an even embarrassing church. Paedophilia and clericalisation of the church are what they know now and sadly it is a church that has no relevance in their lives or that of their friends. Luckily they still believe in Jesus and his examples and for that I'm grateful. When I talk to our grandchildren about Jesus' stories and the things he does, there seems to be a growing dissonance with what our church says and does. Let the wheel turn ,let the fresh air in,let the revolution pick up some momentum. Thank God for a glimmer of hope with pope Francis. And thank God for Eureka street giving the daily messages of hope and truth. "Whether they knew it or not" indeed! one could say the same about Vatican 2 "Whether they knew it or not"! Ignorance is bliss? I think it really is much too early to be describing him as a revolutionary. To disagree with Neil's first sentence, I don't even think it is already clear that he has a strong reform agenda in mind. For anyone hoping Francis was going to close down the Vatican Bank, the announcement that it will begin publishing an annual report can only seem like a damp squib. What is already clear, I think, is that he has a sense of humour and is a bit of a tease: with actions like washing the women's feet on Holy Thursday, he certainly has some conservatives jumpy and he seems to be enjoying that. All of which makes him a breath of desperately needed fresh air but not yet a revolutionary. It may surprise some here to learn that Pope Benedict built bridges: his conversation (as Joseph Ratzinger) with the atheist Jurgen Habermas is an object lesson (from both men indeed) in dialogue. ("The Dialectics of Secularization"). His discussion of the insights of Rabbi Neusner in "Jesus of Nazareth" - another instance of deep listening, welcomed by Jewish thinkers. And his controversial Regensburg address paved the way for the launch of one of the most successful Islam-Christian dialogues ever, the "Common Word" initiative. But it should also be mentioned that Pope Francis' supposed "inclusive" style includes elements of - to coin a phrase - a brusqueness which startles. He has already spoken often of the presence and power of the Devil, perhaps more frequently than any recent pontiff. He has insisted that politicians (and others) facilitating abortion should be denied communion. He stated on April 22 that Jesus is “the only gate” for entering into the Kingdom of God and “all the other paths are deceptive, they are not true, they are false.” Next day His Holiness reminded the Cardinals that “the Christian identity is a belonging to the Church, because to find Jesus outside of the Church is not possible.”: themes of “Dominus Jesus” that its author, the “non-inclusive” Joseph Ratzinger, would recognize and unhesitatingly affirm. Thanks, Neil Ormorod for a wonderfully hopeful piece. God knows we need hope! There may be some dichotomy between Pope Francis and his predecessor, but there has always been room for complementarity without contention in the Church. Associating Benedict with 'theological narcissism' would be a painfully two-dimensional perspective. Have we already forgotten the trepidation with which the election of "God's Rottweiler" was greeted, followed by the revelation that the man was not, after all, a thin caricature of some Grand Inquisitor? We're all inclined to see what we want to see, but it's a pity that people are unable to see how the Spirit will build on Benedict with Francis. Francis will surely upset and admonish those who took Benedict's papacy superficially as an endorsement of their own excesses; but the idea that 'smaller' and 'purer' is at odds with openness and charity could be repudiated by the very obvious example of St Francis himself. Benedict is not the sum of his supporters' wishful-thinking or his detractors' fears, nor, thank goodness, will Francis be. HH, the church should be denied communion in that case because it facilitates abortion by not allowing women the moral option of contraception. Disappointingly by my basic reckoning Pope Francis has already dropped the ball by appointing George Pell to some advisory panel to guide him .It seems absurd that the humble man who showed his colours by dismissing the traditional red cape at his inaugeration, seeks guidance from a man who revels in such grandeur .Well I certainly heard from a reliable source that in fairly recent times Pell indulged himself by having a very elaborate & likely very expensive new red cape created ,probably to assert his Princedom . I had serious hopes that Francis would correct the gross injustice inflicted on Bishop Bill M by re-instating him .The man who lacked the guts to raise the issue with the perpertrator,Ratzinger ,is unlikely to raise the issue with Pope Francis. I agree with you JOHN KERSCH, but to see it from a positive perspective, maybe the diversity of practices in our church is a healthy sign of increasing democratisation. Aurelius,"the church should be denied communion in that case because it facilitates abortion by not allowing women the moral option of contraception". Do you really think that women who are willing to conform to the church's forbidding of artificial contraception will be looking for abortion when they become pregnant? Now in the Italian newspaper Il Foglio, this from Pope Francis to Italian bishops opposed to Summorum Pontificum: La messa antica non si tocca, il Papa gesuita spiazza ancora tutti (“The old mass is not to be touched, the Jesuit Pope wrong-foots everyone”). Excellent news, to be sure. 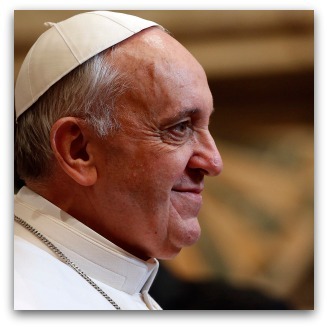 But: Pope Francis - "revolutionary", or Benedictine restorationist?